Kirini hotel is a member of Relais Chateaux. 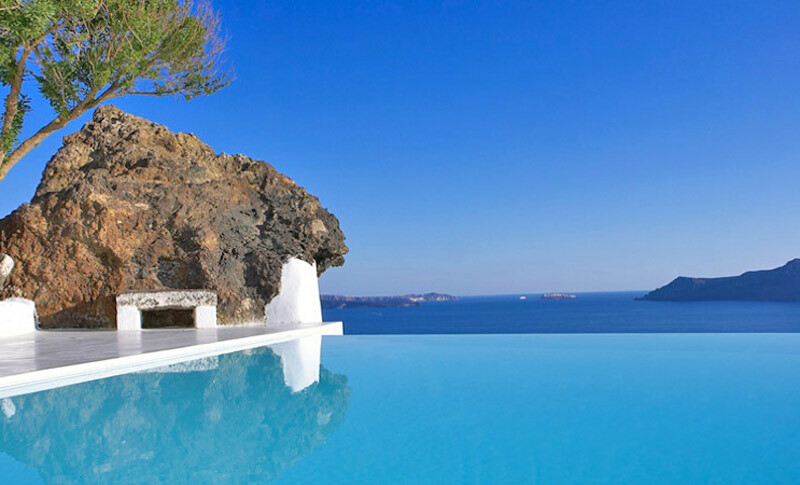 It is nestled on the Cliff, overlooking the Volcanic islands of the Caldera basin, taking in the beauty of the most dramatic views of the Aegean. Conveniently located, it is only 30 min away from Santorini international airport and Athinios port. The Cycladic architecture of Kirini hotel evokes a sense of serenity. Kirini hotel combines the Aegean traditional charm with modern comforts. Bedroom, sitting room, dinning area, bathroom with bathtub or shower, private veranda, all of them with sea view. Bedroom, sitting area, bathroom with shower, private veranda with 2 posts Jacuzzi, all of them with sea view. Bedroom, open plan sitting and dinning area, bathroom with bathtub or shower, indoors Jacuzzi with views to the Caldera, private veranda, all of them with sea view. Bedroom, open plan living room and dinning area, bathroom with shower, private veranda with open air 2 posts Jacuzzi and sea view. Jacuzzi, private veranda with plunge pool and sea view. Each of the accommodations of the property offers air conditioning, satellite TV, individual CD player / radio, direct dial phone, in room safe deposit boxes, mini bar, mini cellar, hair dryer, bathrobes, slippers and other comfort amenities. Kirini hotel offers 24 hours service which includes: assistance on your guests’‘life on the island travel arrangements, valet and butler service, food and beverage service in the privacy of the residence, twice daily maid service, in house laundry and pressing. Pool Restaurant, carved into the earth, situated by the swimming pool, offers breakfast and a variety of Greek and international delicacies during the lunch and dinner hours. The Basilico Gourmet Restaurantis a small “A la Carte” Gourmet restaurant you may have a romantic candlelight dinner at an open-air veranda with spectacular views, and taste our chef’s culinary proposals, based on the seasonal products of the sea and land of Santorini. The White Cave Restaurant offers a full menu of Greek cuisine in a cave overlooking the Caldera, the four tables “White Cave” Restaurant. Wine Cellar during sunset, residents can participate at a ceremonial wine tasting and experience a selection of famous Santorinian wines. Kirini hotel offers Caldera Spa Facilities: showers, toilets, sauna, steam room, jet showers, indoor Jacuzzi and heated pool, treatments space for massage, facial and body treatments and beauty parlour. Due to the particular construction of the Hotel (on the cliff), for safety reasons, our Hotel does not have any children facilities and does not accept under the age of 13 years old. -Wine and fruit upon arrival. -Due to the particular construction(on the cliff) for safety reasons, Kirini hotel does not accept children under 13 years old.